What a day, what a celebration! On Thursday the wider MTB community, MX crew, friends and family of James 'Dodzy' Dodds gathered in Rotorua to celebrate the life of a Legend. 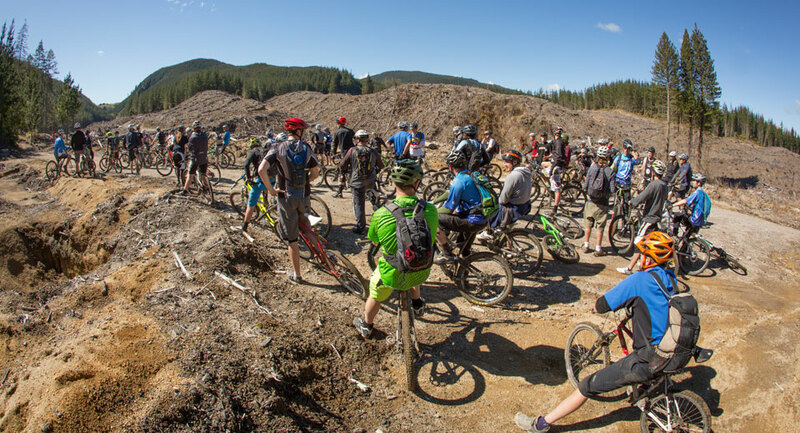 At 10am 100+ riders gathered at the Long Mile Road Gate and after some words from Jeff Carter (Dodzy's good mate and business partner) about the impact Dodzy had on the trails in the forest and which ones he had a hand in making we set off to sample some of the goods. A train of 100 people sessioning the likes of 'The Corridor' is a site to behold and the woops and hollers Dodzy would be making if he was part of it were echoed by those there in memory of him. A few hours on, 60 odd riders assembled at Bike Culture bike shop, and rode their way to 'the Redwoods' where the funeral was about to take place. Upon arrival they were met by literally a sea of people, over a thousand had gathered at the funeral to say their goodbyes. Tributes from friends and family were spoken, celebrating the energy, zest for life, drive, determination and the plain fact that Dodzy was one heck of a great guy. The sheer size of the crowd was testament to how much impact Dodzy's life had on everyone in just his few short years. We're all left wondering how he had the time and energy to spend time with so many people! The family left the funeral to say their own goodbyes while the rest of us gathered at 'The Holiday Inn' to continue the celebrations (many into the following day!) sharing stories, memories and watching a slideshow of Dodzy's many adventures. The impact Dodzy has had on the MTB community really has been huge, from thousands of people taught on Skills Clinics with his partner Gabby to the numerous trails in Rotorua that have his mark on them, to the trails abroad he's helped develop while offering riders the opportunity to work overseas on these trails and in turn helping them live out their dreams. True legends don't come around very often and with Dodzy's passing we've just lost a great one. But his legacy will enable others to "Live The Dream" and we can only hope they leave the lasting impact on the world that he has!